One of the biggest dairy goats in terms of popularity is the smallest in stature. These knee-high ambassadors for dairy goats are enjoying rising popularity due to their miniature size and colorful markings. They have carved out a unique niche as a multi-purpose miniature goat: a wholesome source of caprine dairy products for family or homestead farm consumption with universal appeal as loveable, gentle pets, “living lawn ornaments” and weed control. 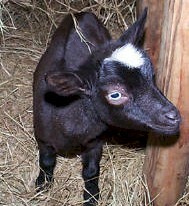 The Nigerian Dwarf goat is a miniature dairy breed of West African origin. Their small stature means that they do not require as as much space as their larger dairy goat counterparts and their gentle, friendly personalities make them good companion pets and easy to handle – even small children can be at ease with these little goats. Nigerian Dwarfs are still considered “rare” by the American Livestock Breeds Conservancy, with their numbers totaling about 7,000 in the national registries. A healthy Nigerian Dwarf doe can produce a surprising amount of sweet milk for her small size – up to two quarts per day. In addition, Nigerian Dwarf milk is higher in butterfat (6-10%) and higher in protein content than most dairy breeds. However, many Nigerian Dwarf owners do not raise their goats for milk but for the pleasure and companionship that these little caprines bring to their lives. Although they have similar origins, Nigerian Dwarfs and African Pygmies are separate and distinct breeds. Pygmies are bred to be “cobby” and heavy boned. Dwarfs are bred to have the length of body and structure in proportion to their larger dairy goat counterparts. Pygmies are also primarily “agouti,” with black, silver and caramel being the most common colors. There is no color discrimination among Nigerian Dwarfs under AGS (American Goat Society) registry. Under NDGA (Nigerian Dwarf Goat Association) registry policy, pygmy coloration and pattern is a minor fault. Color is one of the factors that makes breeding Dwarfs so popular. You can never be sure what color the babies will be until they are born; even then you can’t be sure because many times their color will change. Main color families are black, chocolate and gold with virtually every color combination imaginable being produced. Dwarfs can be Dalmatian spotted, pinto-patterned, tri-colored or just classy shades of solid jet black, white, chocolate or gold. Buckskin patterns are also popular, described by contrasting facial stripes, a “cape” around the shoulders with coordinating leg markings. Brown eyes are most common; however, dwarfs with china blue eyes are becoming increasingly available. Dwarf goats are gentle and loveable. Their calm, even temperament and engaging personalities make them suitable companions for all, including children, the disabled and the elderly. Even breeding bucks are handled easily. Because of their gentle temperaments, Nigerian Dwarfs make wonderful pets and great animal projects for children and young adults in FFA and 4H. 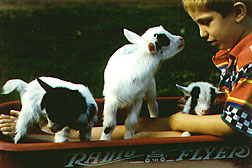 Breeders of other types of goats find that their Dwarfs blend in with the rest of their herd and do not need special quarters; just adequate fencing to contain them because of their small size. Many Nigerian Dwarf goats share pastures peacefully with other livestock such as cattle, horses, llamas, and donkeys. For one to just a few goats, many owners find that an oversized dog house or two does the job. For a few to several goats, a small barn or loafing shed can be used depending on the climate. Good ventilation and dry quarters is important for healthful Nigerian Dwarf care. Many owners find that providing a few “toys” for their goats provides them with hours of caprine entertainment. Tree stumps, rocks or empty cable spools are great for “king of the mountain” games and jumping. Dwarf goats breed year round. Many breeders breed their does three times in two years, giving the doe at least a six month break. Of course, this is a personal choice for each breeder. For the most part, Nigerian Dwarfs are a hardy breed with few kidding problems. New babies average about 2 lbs. at birth but grow quickly. Does can be bred at 7- 8 months of age if they have reached a good size. Some breeders prefer to wait until they are at least 1 year or older. Dwarf does can have several kids at a time, 3 and 4 being common and sometimes even 5! Dwarfs are generally good mothers able to take care of their babies should you leave them to do the raising of the kids. They can also provide a surprising amount of milk for their size if you decide you want your own delicious goat milk. Bucks are able to be used for service as young as 3 months of age and easily by the time they are 7 or 8 months old. Because they can be fertile at such a young age, breeders are advised to wean does and bucks separately. Dwarf bucks are vigorous breeders but are gentle enough to be used for hand breeding or pasture breeding. Both methods are used successfully. Average cost for registered breeding stock is $200 to $500, with champion pedigrees, milk production record animals and unusual coloring receiving premium prices. Pet quality stock often costs much less, and wethers (neutered males) can be purchased for around $50 to $100. Visit our Breeds & Breeding forum section and our milking section! Ken Myers on New to Goats?